Prime factorization: 11 is prime. The exponent of prime number 11 is 1. Adding 1 to that exponent we get (1 + 1) = 2. 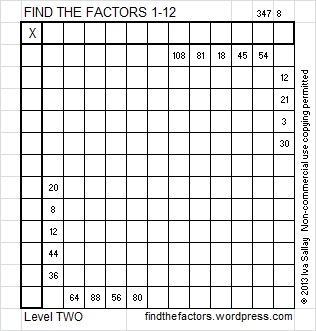 Therefore 11 has exactly 2 factors. 11 has no square factors that allow its square root to be simplified. √11 ≈ 3.31662. How do we know that 11 is a prime number? If 11 were not a prime number, then it would be divisible by at least one prime number less than or equal to √11 ≈ 3.3. Since 11 cannot be divided evenly by 2 or 3, we know that 11 is a prime number. 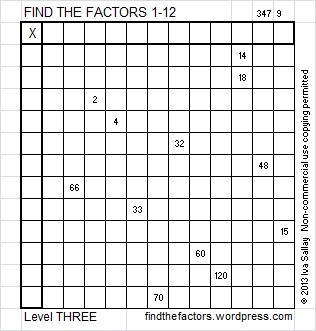 Sometimes 11 is a clue in the FIND THE FACTORS 1 – 12 puzzles, and the factors are always 1 and 11. I have more blessings than I could ever completely count. This is not the place where I will attempt to name them one by one, but I wonder: is the number of blessings that I or anyone else has finite or infinite? Even being able to ponder that question is a blessing. In the last few years in the United States, much of the gratitude part of Thanksgiving has gotten lost in commercialism. Therefore, for some people the number of blessings may be finite and easily measured by counting things. Some of those blessings may be more imaginary than real. Nevertheless, there are still people who can see the hand of God all around them. For them the number of blessings is infinite. Likewise those who rely on the Savior and His infinite atonement have an infinite number of blessings. As I count blessings, I find that some of them are prime, and some are a composite of several blessings working together. Some blessings are rather odd while others are shared evenly. I am grateful for many positive events in my life, but even negative experiences are blessings because they have helped me to grow. 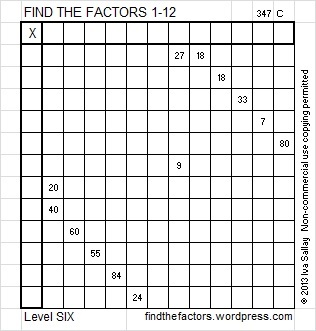 The following blessings may seem trivial, but I am grateful that WordPress has given me a way to share the Find the Factors puzzles not only as jpg pictures, but also in an excel file. The puzzles have been a blessing to me, and I want to show my gratitude by sharing them with other people. I am grateful for the blogs I follow. They challenge me, entertain me, and teach me so much. I am also thankful to everyone who has looked at my blog. 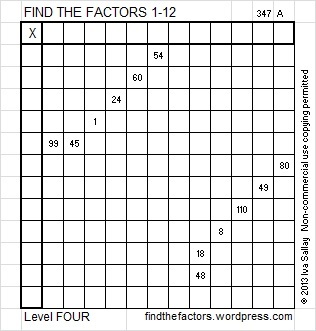 Click 12 Factors 2013-11-28 to see the same puzzles in excel. ← 10 Just Like Sudoku? These are awesome! I’m going to print them now so I can solve them. I love logic puzzles! Thank you so much for sharing your blog with me! You will be named on my puzzle sites page! You’re AWESOME! Thank you. As you wrote in your blog, http://memorysmysteries.wordpress.com/2013/12/10/memorys-mysteries/, puzzles are good for the brain. You do more than just talk the talk, you walk the walk. You’re awesome, too!